Double Pinks usually refer to designs with two or more shades of pink, rose and red. I checked two references for dates. 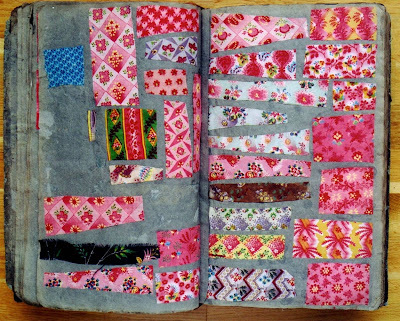 Textile Design gives 1860-1920 while Dating Fabrics,A Color Guide has 1850 to early 1900. I think I would extend those dates from the early 1800s to the 1950's. They have also been a favored reproduction designs of the late 20th century. This is a page from my c. 1830 Dargate book with early double pinks. This Double blue is from the Dargate book. Note the engraved background and then the overprinted leaf/vine. This is from the Dargate Prussian Blue line, 2006. 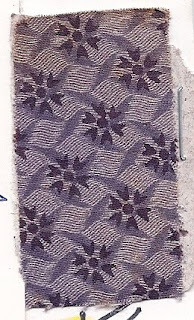 This Double Violet is the header for Cottonopia and is from an 1863 sample book. I often hear experts speak of a classic Double pink having a white dot. This could be acheived with the dischage method: the cloth was 'padded' with mordant, then a 'covering' cylinder with a different strength mordant, dried and overprinted with an acid paste. Once the goods were processed in a madder dye bath you had a solid looking packground (from the pad) with a viney design ( from covering cylinder) and a scattering of white dots ( from the acid paste). 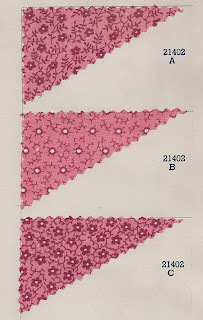 This production method was popular in the later part of the 19th century for not only pinks but also double purples, blues and some browns. It could produce complex designs often referred to in dyeing manuals as "3 reds" or "5 purples". A classic Ely and Walker style double pink from the last third of the 19th century. 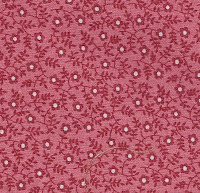 These are 3 Double Pinks from the Ely and Walker "Quaker Chintz Prints" from their 1948 sample book. Dating Double Pinks can be tricky. It is a acquired skill. When looking at a dated quilt observe the double pinks, noting the method used ( engraved background vs padded ) and the styling of thse much loved prints. I love your posts, thanks so much for sharing your knowledge. Those pinks with the yellow accents are making me hyperventilate. Is there a chance of any of them being reproduced in the future? In any case, thank you for sharing those pages...lovely! I printed my first 'offical' line of Dargate designs with FASCO in 2002, Dargate Doubles. Before that, 'my banker' and I did a line. One of the prints was a pink/yellow. Could you pleaseplease do that again, i must have missed those and feel like i absolutely NEED them!! I keep searching Ebay in the meantime... Thanks for sharing those lovely pages! !